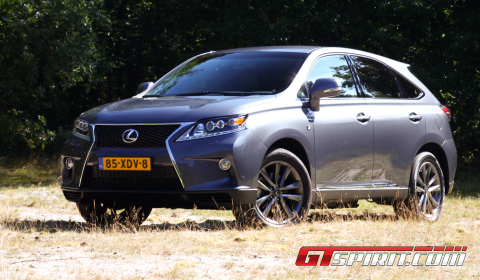 The 2013 Lexus RX450h F Sport is a new member to our road test list. The third-generation five-seater hybrid SUV received earlier this year a refresh for the 2013 model series. 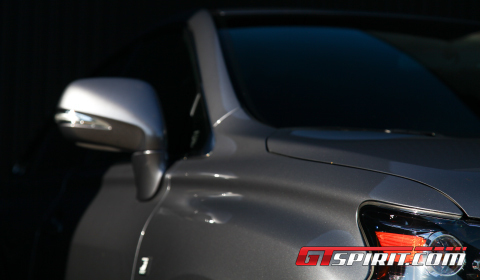 The changes consist primarily of cosmetic interior and exterior updates and a new Sport mode. The F Sport body and interior package – fitted to our tester – adds a new look to the midsize SUV. The exterior upgrades feature a new spindle grille, a new front new bumper, a new headlamp design featuring LED daytime running lights and distinctive fog lamp bezels. A new 19 inch wheel design joins the currently available 18 and 19 inch aluminum rollers and four new exterior colors are available: Platinum Silver, Garnet Red, Fire Agate, and Lapis Lazuli. Interior enhancements include a new steering wheel, Bird’s-eye maple wood trim and available Saddle leather interior. The new Sport mode provides a revised steering effort, throttle mapping and transmission-shifting priorities to fully exploit the capabilities of the hybrid power train. When engaged, the Sport mode not only modifies the electric-power-steering and throttle settings for faster response, but also is said to provide less-intrusive operation of the car’s stability- and traction-control systems. The new mode also changes the instrument panel’s illumination from a peaceful hybrid blue hue to a fiery red. The power source is still the same 3.5 liter V6 Atkinson-cycle engine paired to electric motors that are powered via batteries. The front-drive model’s hybrid power train employs two motor-generators. One is an engine-driven generator that operates as an engine starter and can charge the battery pack or power other electric motors if needed. The second one is a 167 horsepower motor that works with the gas engine to deliver power to the front wheels. The total output of this pairing is 295 horsepower with the peak output for the RX 450h’s gas engine and electric motor occurring at different rpm ranges. Both the engine and the drive motor are connected to a continuously variable transmission. A third, rear-mounted motor-generator is added on the AWD model to drive the rear wheels. This combination creates a AWD setup, but not one with off-road capabilities. There is no mechanical connection between the front and rear axles. The smart system only ask more torque from the rear wheels when needed. The smart setup has a low fuel consumption and provides the option to drive in different drive modes. With its selectable EV mode, the RX450h can run short distances on electric power, but only under specific conditions. There is the ability to run electric-only or gas-engine-only modes as well as a combination of both. A start/stop system is also part of the ‘Green’ package, which has a maximum speed of only 200km/h. 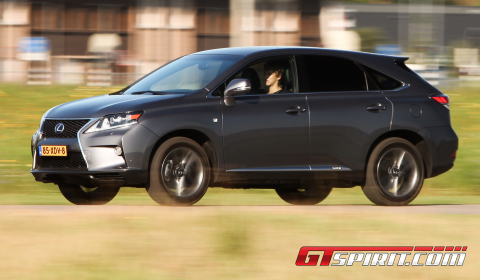 The RX450h has a smooth ride and a complaint suspension. The power train is pretty silent with a surprising amount of noise when you floor the throttle. The steering is sufficient and with the Sport mode enhanced it feels slightly more livelier. The tall and heavy vehicle is not a cornering hero, nor does it have the ultimate fun factor. The RX450h is highly capable of transporting five people and their luggage in a comfortable and fuel efficient way. The interior offers reasonable levels of refinement. New extras for the 2013 model are a new steering wheel, new metallic accents and more storage room in the center console. New Ebony Bird’s-Eye Maple wood trim and available Saddle Leather interior is also available upon request. The standard ten-way power front seats are shaped and cushioned for long-haul comfort. The rear seats have enough space for three people. Behind the seats, you will find a 500 liter luggage compartment, which grows to 825 when the rear seats are folded. The standard equipment of the F Sport features a complete interior F Sport kit with interior decals, head up display, Black roof liner and Steel Silver interior panels. Available on the option list are an Adaptive Cruise Control, electric sunroof and 330 watt Mark Levinson sound system with 15 speakers, video function and 7.1 Dolby Digital/DTS Surround Sound. The refreshed 2013 RX450h F Sport is definitely a SUV for the tech-savvy customer willing to invest in a fuel efficient midsize SUV capable of transporting four to five people comfortable from A to B. The hybrid-powered AWD is all about environmental friendliness combined with a complete, balanced and satisfying package. The RX450h is definitely a good car and a better looking SUV in its F Sport dress, but it is unfortunately not as good as some of its similar priced rivals.